JOURNEYS THROUGH TIME: America Has Chosen! Perhaps the reason for my delay in posting this blog is that I'm still pretty much whacked after staying up 'till 5.30am Wednesday morning having shared during the night America's euphoria brought about by the historic election of its forty fourth president, Barack Obama. Not since President Kennedy's visit to Ireland in June 1963 when I stood with my mother at the front of the barrier lining O'Connell Street have I felt such a huge rush of emotion for a political leader. Well, perhaps just once and that was when Bill Clinton was first elected president back in 1993. 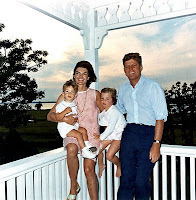 He too was Kennedy-like, handsome and oozed heaps of charisma, still does. What I admire most in Barack is his total honesty. He has not promised that all this change will come about in his first few months in office. Indeed he has said in his first news conference this evening (Friday, 7/11/08) that some problems may still not be resolved by the end of his first term. I somehow think the world will be patient. It was very touching to hear him answer the personal question asked by a member of the media about what kind of puppy his daughters would be getting. We heard from him that his eldest daughter, Malia, is allergic to I guess animal fur so they have to be very selective of their puppy choice. That revelation really showed the man as a human being not the imagined cold-hearted political figure who will be living in his ivory tower. No, he is a concerned loving parent just like the rest of us. 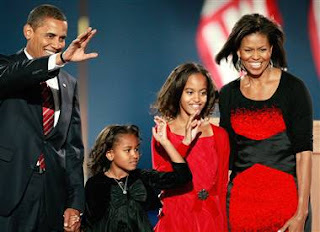 I wish president-elect Barack Obama and his family a long, safe and joyful residence in their new home. Thank you for your kind comment. I feel he's going it give it his best shot, he certainly has a lot to contend with. We live in hope.